If you ask people for a definition of urban sprawl, you're likely to hear all kinds of negative reactions about bland suburban communities before someone actually discusses the core meaning. Here we think a more useful explanation of sprawl is the condition in which the rate of expansion of the land used for developed purposes, as documented in the U.S. by the Census Bureau and termed "Urbanized Land," exceeds the population growth rate. By developed purposes, we mean areas that aren't devoted to wilderness or agricultural land uses, such as residential, commercial, industrial, or school and institutional land uses, or airports, highways, and so forth. And just like on the parent page about dispersed development, we want to emphasize that a village of 1,000 people could have a small town sprawl problem, so when we say urban sprawl, it is not all about the bright lights of the big city. Only the 400 or so Urbanized Areas recognized by the Census Bureau will have precise statistics at their disposal, but almost any size of community can sprawl. If you are the type that likes to use correct terminology, we think that what makes suburban sprawl is the fact, for example, that your increase in urban land consumption is 30% higher than your population growth over the same time interval. Sprawl has become a worldwide phenomenon. Great and walkable European cities are sprawling outward, even though their centers hold together in the traditional pattern. The suburbs in Europe often tend to be the lower-income areas of the metro area, though, in contrast to the U.S.
And in the developing world, poor quality ad hoc shelters are huddled together on the peripheries of major cities. The United Nations continues to report urbanization as a major global trend, and many experts consider now the first time in recorded human history when the majority of the population was in an urban area. The question is how compact and efficient these urban areas can be. Some people seem to include in the definition development types that they consider unsatisfactory, such as large-lot single-family homes, strip malls, fast food rows, big box stores, and such. So we might say that the definition of urban sprawl is expanding to mean anything about suburbia or exurbia that the author doesn't like! The definition of urban sprawl is not worth a big fight, because many of the negatives sometimes erroneously associated with a strict interpretation of sprawl probably are worthy of your community's concern. If you have poorly constructed, fast growing suburbs, the shoddy construction itself can cause failing suburbs, or at least ailing suburbs, in as little as 30 years. Yes, it's worrisome if your growth is chaotic. If all the development is of low density, meaning few people per acre or square mile, yes, it will cost the public sector more per person to service that area. Some people use the word sprawl as automobile-centered, meaning you have to drive to the grocery store. Yes, that's an issue, but it's true of much of America. In fact, cities that aren't growing at all can be sprawling. Another way to think of sprawl is to think of it as loss of rural land to urban uses. Any metropolitan area with a stagnant population ought not to be building any housing out on its boundaries (rather than the legal boundaries, we mean the real place where streets and houses on small lots turn into farmland or forest). So what if this steady population place wants better housing? Selective infill housing and redevelopment would be great. On other pages, we deal with the causes of urban sprawl, effects of urban sprawl, and urban sprawl solutions, so hop around if you already understand the definition of urban sprawl perfectly. Here we want to give a little more dimension to the explanation by showing some nuances to the definition of urban sprawl. The definitions, statistics, and charts found on the Sprawl City website reject the notion that population growth, or lack of it, should affect the definition of urban sprawl. These good folks believe that simply the expansion of the urbanized area into farmland constitutes sprawl. The U.S. Department of Agriculture's Natural Resources Conservation Service (NRCS) is a major data source for agricultural land. Their latest lengthy National Resources Inventory, released in 2012, can be read on-line. This latest report shows an increase of developed land of more than 3 million acres between 2007 and 2012 alone. People leaning toward the more conservative side sometimes argue that bigger houses and bigger spaces are intrinsic to the American dream. They certainly would reject our definition of urban sprawl, because each person consuming more land would simply mean greater prosperity in their view. Just as a sidebar, my problem with that is that if you're fiscally conservative, you should be really upset about sprawl. It's very wasteful of both public and private money. The latest definitive research is Smart Growth America's "Measuring Sprawl 2014," which updates a 2002 report. Download the whole smart growth report and find out how your metro area ranks on sprawl, as of 2010, if you're interested. 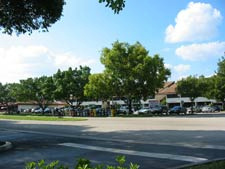 This group doesn't want to offer a simple definition of urban sprawl, but merely starts describing sprawl as creating a landscape characterized by rigid separation of jobs, services, and housing; poor street connectivity; low residential and employment density; and lack of intense centers of activity and quality downtowns. I like our simpler definition of urban sprawl better because it focuses on the impacts to land, but still allows growth in urbanized land use if there is population growth. Moving isn't illegal in the U.S. last time I checked. But the Smart Growth America arguments are a great segue to our page about the effects of urban sprawl, whether it is occurring in your city of 15,000 or your city of 2 million. If you are interested in why your core city or inner suburban neighborhood is struggling, you need to get involved in this issue. There are sprawl solutions, but it will take some really challenging coalition building to make them happen, since regional governance is so weak in most metropolitan areas.